The UK Government has introduced a five-year national action plan detailing how the UK will contribute to containing and controlling the growing global problem of antimicrobial resistance. This, along with a 20-year long-term vision, follows on from the five-year plan begun in 2013. Without any action, the government says, antibiotic resistance is predicted to kill 10 million people a year by 2050, and render routine operations extremely hazardous. Since 2014, UK antibiotic use has fallen by 7%, and by 40% in food-producing animals. Yet the number of drug-resistant bloodstream infections rose by 35% in the five years to 2017. The plan’s aims include achieving a 10% fall in drug-resistant infections by 2025, and a 15% drop in human antibiotic use. It also targets the prevention of 15,000 healthcare-related infections by 2024. 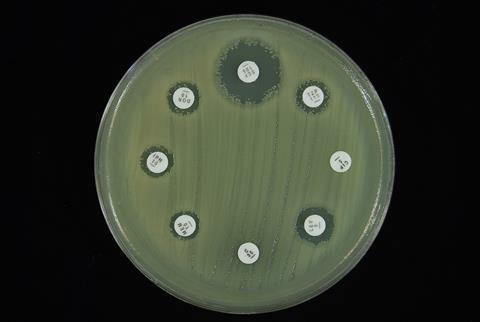 No new classes of antibiotic have been discovered since the 1980s. The hope is that existing antibiotics can be kept effective for longer by reducing resistant infections, and by supporting clinicians in appropriate prescription. Because new antibiotics that treat resistant bacteria will, rightly, be reserved for only those infections where they are truly necessary, the limited market provides little incentive for the profit-driven pharmaceutical industry to invent new ones. The National Institute for Health and Care Excellence (Nice) and NHS England are to look at a new payment model that pays companies based on the value of their antibiotics to the NHS, rather than volume sales. Industry has welcomed this. ‘We have been working closely with the government for the past two years, and pharmaceutical companies are ready and waiting to start testing a new model to support antibiotics R&D in 2019,’ says Mike Thompson, chief executive of the Association of the British Pharmaceutical Industry. ‘It’s great to see the UK government and NHS committed to exploring a new payment model for antibiotics in our market,’ says Steve Bates, the BioIndustry Association’s chief executive. ‘Ensuring these incentives work for innovative small biotech companies and their investors is vital as we continue to see established players divesting.’ He adds that political leadership is important to inspire similar mechanisms in other countries. Resistance is a global problem, and other initiatives include the Global Antibiotic R&D Partnership, backed by the World Health Organization and the Drugs for Neglected Diseases initiative. It recently signed a deal with Eisai and Takeda for the Institute Pasteur Korea to screen parts of their chemical libraries in search of novel compounds with antibacterial activity, and received a €50 million (£43 million) investment from the German government.